Bought these levers because the stock levers for the fz09 are crap. 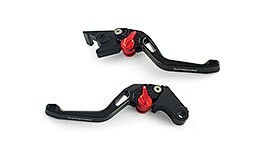 If you are looking to replace yours levers for the fz09 or any bike these fit I definitely recommend these. They don't feel cheap at all. There is no play in levers like you would get with other cheap knock offs. Could use some different colors. I like the black but not every one does. Disadvantages: - They only come in black. I honestly have no idea how I used stock levers for so long. These shorty's are perfect and not only look so much better but they feel better and work perfectly. I've never once thought wow these are short. They're actually just the perfect size. Advantages: Look amazing, give your bike a far more premium look over stock and feel great.